Live Performance Australia (LPA) takes great pleasure in presenting our Ticket Attendance and Revenue Survey for 2014 (“Survey”). This is the 11th annual Survey presented by LPA. The Survey is now the principal source of reliable industry statistics for the Australian Live Performance Industry, and represents the most comprehensive available survey of ticket sales for Australian Live Performance events. As the Industry’s leading source for up-to-date results and trends, the Survey is drawn upon extensively by the industry, government, media and business. The development of LPA’s research reports, integral to promoting the value and importance of our industry, would not be possible without the generous support of our long-term partner and industry super fund, Media Super. 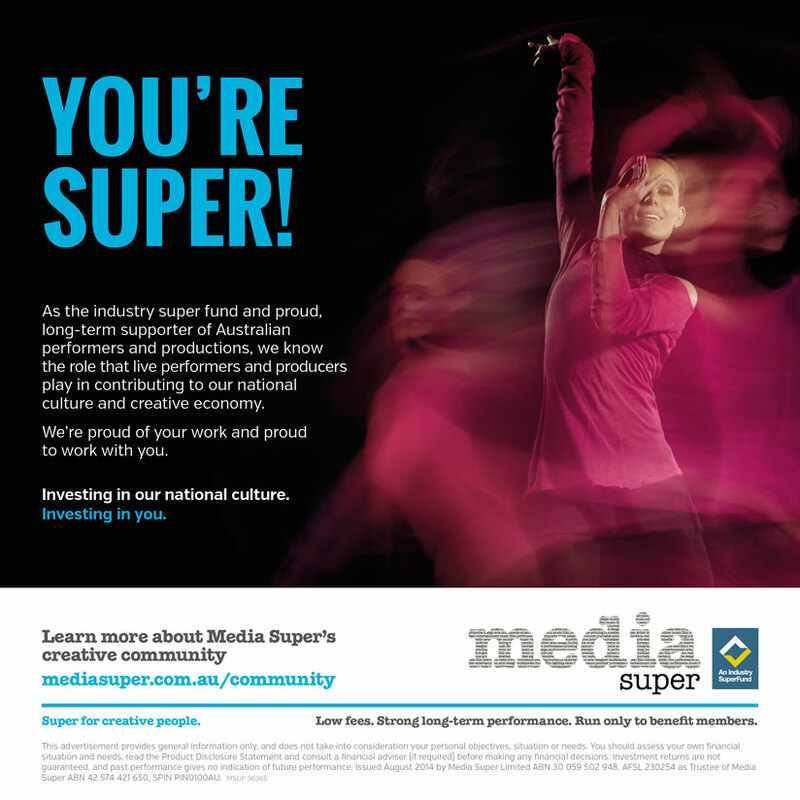 Media Super has a long and respected history as a key supporter of Australia’s creative industries through sponsorship programs, employment and financial education support, as well as celebrating the excellence of Australia’s cultural offerings. LPA sincerely thanks Media Super for its continued partnership and support of this research. This year we have introduced a dedicated section for individual state results in our Digital Report, which highlights key data and trends for each individual state and territory. This includes figures of revenue and attendance from 2009-2014, and category share of both revenue and attendance by state. We have also developed new infographics for each state and territory that highlight useful facts and figures. Approximately 18.54 million tickets were issued to live performance events in Australia in 2014 – an increase of 3.4% on 2013 when 17.93 million tickets were issued. Ticket sales in 2014 generated total revenue of $1.51 billion, up 2% on 2013 when ticket sales totalled $1.48 billion. This increase in revenue occurred as a result of an increase in the total number of paid tickets, despite a decline in the average ticket price. On a like for like basis excluding new data providers, the industry experienced a slight decline in revenue (4.1%) and attendance (5%) in real terms between 2013 and 2014. This year’s Survey includes data from new partners Brisbane Powerhouse, Hayes Theatre Co, MONA and Oztix. The Queensland-based venue Brisbane Powerhouse provided data for events across most categories. The Sydney-based Hayes Theatre Co predominantly presents small-scale musical theatre and cabaret. MONA provided ticketing information for MONA FOMA and Dark MOFO in the category of Festivals (Multi-Category) as well as some smaller events in the Contemporary Music and Special Events categories. Oztix provided ticketing information for events in most categories, with an emphasis on Contemporary Music and Festivals (Single-Category), which had a significant positive impact on these categories. The addition of new data partners is important to improving the reach and coverage of the Survey. We encourage event owners and ticketing companies not presently included in the Survey to become data partners. LPA is mindful that performances by the small to medium sector, and at regional and metropolitan (non-capital city) venues, continue to be underreported in this Survey. We have worked closely with the Australia Council for the Arts, and the Australian Performing Arts Centre Australia (APACA) to redress this issue in a new supplementary report, for which the 2013 figures were released in May this year. Since 2012 the Survey has included an analysis of revenue and attendance on a per capita basis. The results for this year’s Survey show that Victoria, New South Wales and Western Australia command a larger share of both Live Performance revenue and attendance compared to their share of Australia’s population. Although Victoria experienced a decline in revenue and attendance in 2014, it still remained well above its national share of the population and had the highest spend per capita both in 2014 and 2013. Across the other states and territories, all had a smaller share of industry revenue compared to their population, although South Australia and the Australian Capital Territory had a larger share of attendance. Results among the states and territories were mixed. Between 2013 and 2014, New South Wales experienced gains in terms of revenue (10%) and attendance (4.6%). In contrast, Victoria experienced declines in both measures (revenue -5% and attendance -5.2%). Overall, New South Wales and Victoria had combined revenue of $997.21 million and continued to account for approximately two-thirds of the entire Australian Live Performance Industry. Notably, Tasmania and Northern Territory experienced significant revenue growth (382.8% and 45.9% respectively). For Tasmania, at least part of this growth can be explained by the first time inclusion of data from Oztix and MONA. In the Northern Territory, gains were driven by the Contemporary Music, Circus and Physical Theatre and Children’s/Family categories. South Australia also performed well with increases in revenue (7.5%) and attendance (7.8%). Attendance in Queensland grew strongly (14.8%), but growth in revenue was unable to keep pace (1.9%). The Australian Capital Territory experienced a fall in both revenue and attendance. Western Australia experienced a fall in revenue despite higher attendance. As with previous years, the Contemporary Music and Musical Theatre categories represent the two largest categories in the industry, generating 40.1% and 21.2% of revenue, respectively. Combined, these two categories account for 61.4% of the Live Performance Industry in terms of gross revenue and 51.6% of total attendance. The top 3 revenue categories combined, which also includes Festivals (Single-Category) in 2014, accounts for 70% of all industry revenue. The most significant gains were experienced by the Festivals (Multi-Category), Musical Theatre and Special Events categories. We thank our Survey Consultants EY for their professional services in compiling and analysing the Survey data, and our Web Designers Digital Bridge, for their preparation of the Digital Report. We hope you find the digital format informative and intuitive, allowing greater ease of comparison with previous year’s data and tracking of trends. Finally, we sincerely thank all survey participants for their provision of data to the Survey. The generous cooperation and effort of all parties involved is, as always, greatly appreciated. 1 Productivity Commission 2015, PC Productivity Update. My staff aren’t surprised when seizing appropriate opportunities, I treat them to a little rendition of a song from Jesus Christ Superstar. While I could educate them and deliver the entire production from heart, verbatim, I’m usually encouraged to wind up somewhat earlier than the scripted curtain call. I didn’t mind so much recently though, when immediately after my homage, a young colleague, who’d only recently joined us, knocked us all down with the most delicately beautiful performance of an aria and declared herself a classically-trained singer of very high calibre. It was breathtaking and amazing, but not completely unexpected. For you see, we not only work for our industries and our members’ careers and pursuits, but we are also of them. Our team comprise a veritable melting pot of performers, writers, aspiring producers, actors, musicians, industrial relations people and a number of other fields. All qualified and talented professionals in specialties and areas that we employ them for, they are more rounded than you might expect and that’s something we pride ourselves on. At a time where the creative arts are facing government funding cuts and less solid support than ever before in this country, Media Super remains steadfastly committed to the people who entertain us with their talents and their charms, and to the businesses that employ them and foster this creativity. Over our 28-year history we have been a key part of Australia’s creative industries through sponsorship programs, employment and financial education support, and celebrating the excellence of performers all around the country. This survey and findings provide us all with valuable data, information and trends. It gives us a snapshot of where patrons are spending money and provides the credible support for our industry’s lobbying for funding and support. We are a proud and long-term partner of Live Performance Australia and the crucial work they do on behalf of our industry. LPA is represented on our Board and brings expertise and support for all members in the super fund. If our national culture is to continue being both vibrant and celebrated for its quality productions, partnerships such as that between LPA and Media Super are critical. In 2014, growth in the Live Performance Industry subsided following strong gains in 2013. The modest growth that was achieved is attributable to the inclusion of new data providers; removing their impact, the Industry experienced a slight decline in real terms. This result is consistent with a year of weaker consumer confidence across Australia. Consumer confidence measures the level of economic optimism that consumers have and as such, is an indicator of their willingness to spend. Overall, consumer confidence fell throughout 2014, ending the year at its lowest levels since 20111. Despite the lower consumer confidence, the arts and recreation industry recorded positive productivity growth in 2013-14, outperforming other market sector industries such as retail trade and accommodation and food services2. Results across the categories were mixed. The Musical Theatre, Special Events and Festivals (Single-Category) categories achieved strong growth. Reasons for these gains varied. In the Musical Theatre category, there were a large number of high calibre performances that drew large audiences, including The Lion King, Les Misérables, Grease, Wicked, Strictly Ballroom and The Rocky Horror Show. The Special Events category tends to be volatile and is dependent on the number of performances that cannot be classified. In particular, the national tour of Mythbusters Live in 2014 contributed to the strong growth in this category. The increase for Festivals (Single-Category) was in part due to the first time inclusion of Oztix in the 2014 survey. On the other hand, the Circus and Physical Theatre category experienced the largest decline in both revenue and attendances. The decline was in part due to the reduction in the number of Cirque du Soleil performances, but was further exacerbated by a number of other major performances not returning in 2014 including Slava’s Snowshow and Empire. In 2014, approximately 18.54 million tickets were issued to live performance events in Australia. This represents an increase of 3.4% on 2013 when 17.93 million tickets were issued to events. Of the 18.54 million total tickets, the number of paid tickets was 16.47 million, a slight increase from 16.05 million in 2013. The remaining 2.07 million issued in 2014 were complimentary, sponsor and zero-priced tickets, a rise from 1.88 million in 2013.Ticket sales in 2014 generated total revenue of $1.51 billion, up 2% on 2013, when ticket sales totalled $1.48 billion. This increase in revenue occurred as a result of an increase in the total number of paid tickets, despite a decline in the average ticket price. On a like for like basis excluding the impact of the additional data providers for 2014, the total number of tickets issued in 2014 was 17.03 million, which generated total revenue of $1.42 billion. Therefore, the Industry experienced a slight decline in real terms from 2013. 3 It is industry practice to issue sponsor tickets at zero priced, but these are effectively paid tickets via the sponsorship agreements. In this analysis, the ticketing revenue excludes any sponsorship revenue.